The education and formation of our parishioners is a major priority for our parish. At a child’s baptism, his or her parents and godparents promise to raise the child in the faith of the Catholic Church. Parents are the Primary Educators of their children in faith. It is their responsibility to teach their children about our Lord and His Gospel. It is their role to form the child’s heart and mind by their example of Christian living. It is their role to teach children their prayers and bring them to Church each week. The parish’s Religious Education Program exists to assist parents in their role as the primary educators of their children. We are here to assist you in educating and forming your children to become disciples of Jesus Christ and active members of the Catholic Church. Grades 1 – 7 meet on Wednesday evenings at the St. Joseph school building on North Main Street. Classes begin promptly at 6:15PM and conclude at 7:35PM. Schedule of classes and other information given upon registration. HOMESCHOOL CLASSES are also available for those unable to attend class on Wednesday Evenings. Home Schooling option is arranged on a case by case basis with the Director of Religious Education. Home Schooling is not available for the Confirmation program or for grade 2, as those are Sacramental preparation years. MASS ATTENDANCE: In addition to participating in class, each child is required to attend Mass each Sunday (or Saturday evening). A child can attend Mass at either St. Michael’s or St. Joseph’s, and must sign in each week. Sign in books are located at the main entrance of each Church. If a child attends Mass at another Church, they are asked to bring back a bulletin from that parish, signed and dated by the parish priest. 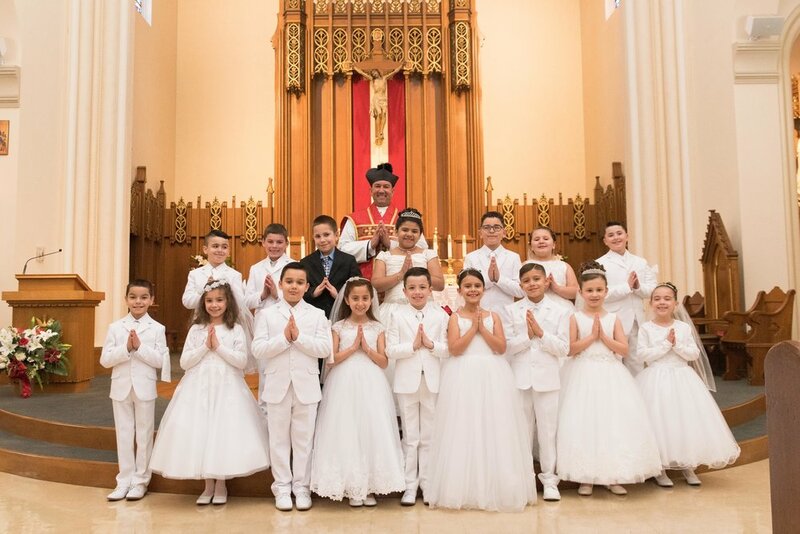 SACRAMENTS: At least two years of formation and active participation (Class and Mass) is required to receive First Communion. Students preparing for Confirmation are required to complete Grade 7 either in the Faith Formation Program or in the Catholic School system prior to enrolling in the two-year Confirmation Program. To assume adequate understanding of the sacraments both students and parents need to be involved simultaneously. List of events for parents is provided at registration. ATTENDANCE POLICY :Good attendance is essential to your child’s growth and progress in the learning of our Catholic Faith. Therefore, only 3 absences are permitted. Children missing more than 3 unexcused classes will be asked to repeat the grade. Please call us when your child is sick or unable to attend. The Religious Education office phone number is (508) 567-3638. DISCIPLINE: Students are with us for a minimal amount of time each year, therefore we can’t afford to waste time due to behavior issues. Parents will be called in when help with this matter becomes necessary. Cell phones are not to be used at any time during class as they provide a great distraction. Phones will be taken by teacher and picked up by parents at the end of class. CLASS: Classes begin promptly at 6:15PM on Wednesdays and the doors of the school are not open until that time. Because there are a large number of children being dismissed at one time, we ask that you come in the building to pick up your child. Please be careful in the parking lot. BIBLES / TEXTBOOKS: Bibles and textbooks are used throughout the Faith Formation Program. Students who damage them in any way must purchase another copy to replace the damaged copy. CONCERNS: Questions regarding the program should be presented and addressed to Father Jay or Mrs. Lisa Ouellette, Director of Religious Education – grades 1-7. or Mrs. Ana Mello, Director of Confirmation Program. REGISTRATION FEE: Registration cost is $30.00 for the first child, and $20.00 for each additional child. Please know this covers only a small portion of the projected cost of our Religious Education Program. However, if any family is unable to pay, please notify Father Jay or Mrs. Ouellette to make other arrangements. DISMISSAL/CANCELLATION PROCEDURES: All students are to be picked up at the parking lot entrance only; this is necessary to insure the safety of your child. Cancellation of classes: Parents will be notified via a phone call if the need arises for a cancellation. Please insure that we have an updated phone number on file. This system will also be used to inform you of any scheduling changes, meeting reminders, etc.